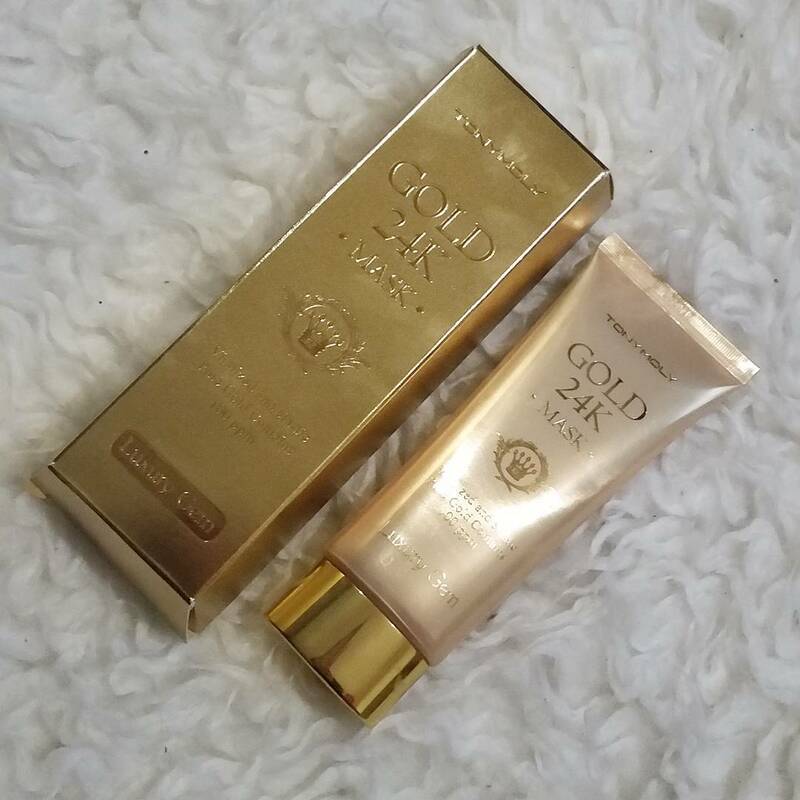 This is a sponsored review. This means I received these Havaianas as a gift, to test them and to write my opinion about it. The fact that I was gifted those Havaianas, will not affect my opinion in any way and my review will be personal, honest and sincere at any time. 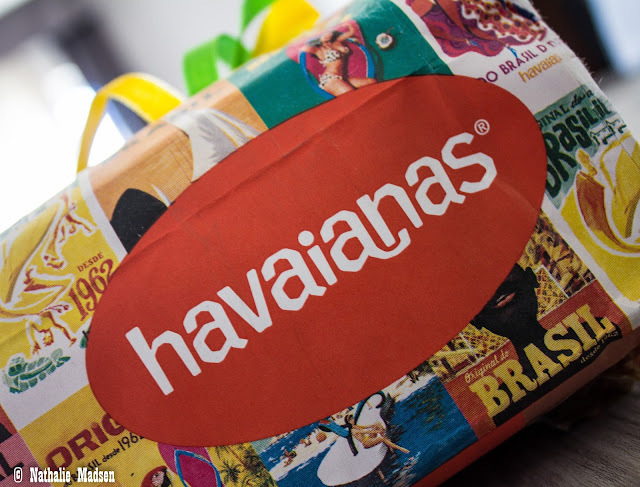 The brand Havaianas was born in the year 1962. Havaianas (which means Hawaiians in Portuguese) are based on the Zori, the traditional Japanese sandals with rice straw soles. That's why the rubber soles of Havaianas are textured, to look like rice grains. 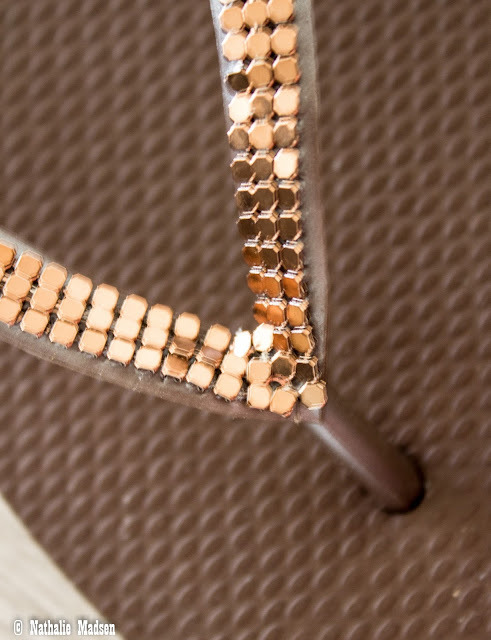 And that's one of the most recognizable and unmistakable details of Havaianas. By 1964 practically every Brazilian was wearing a pair and they were sold on the road, directly from the vans of the distributors. In 1966, they patented the shape of Havaianas and in 1969, more colors were added. 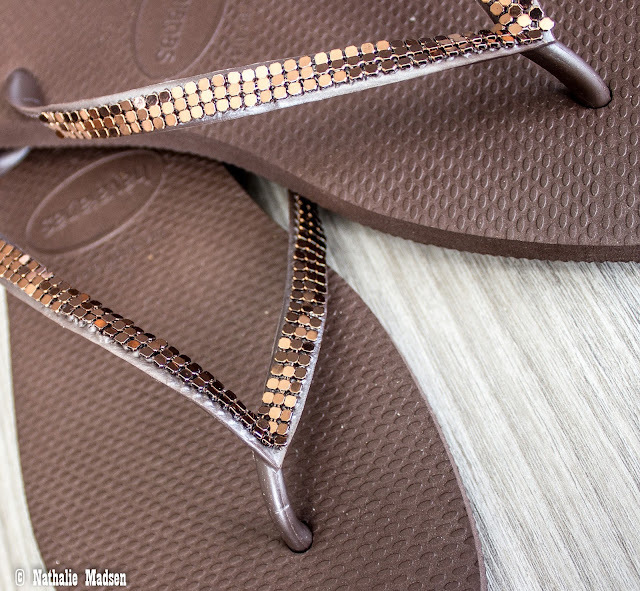 In 2001, Havaianas launched their fashionable Special Collection, featuring exclusive details such as crystals and metal meshes, handcrafted by artisans in Northeast Brasil. And nowadays, Havaianas can be found in more than 60 country's worldwide. 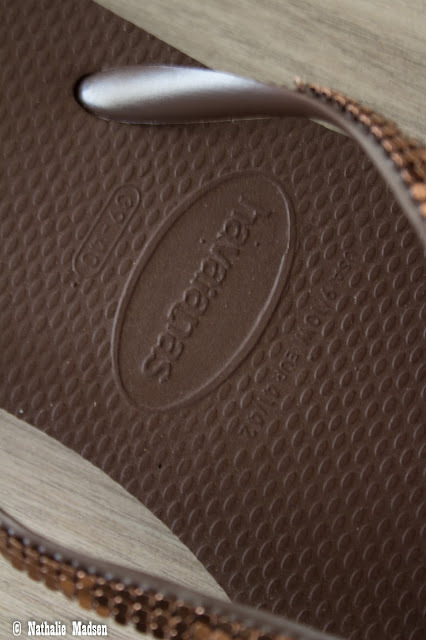 Havaianas are made of biodegradable latex, by the way, so they have a limited impact on the enviroment. 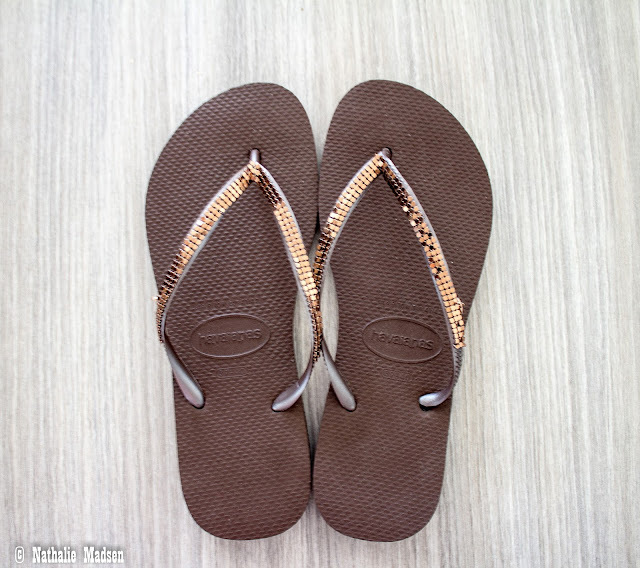 The Havaianas I received, are the Slim Metal Mesh ones, in Café brown. Brazil's original and authentic flip flops with a handsew metallic detail on top. As you can see, these are a pair of the Special Collection models. They will cost you €55. Obviously, they have Havaianas in all price categories, you can get Havaianas for as little as €18. I choose a more glamorous and fashionable pair, because I'm a sucker for bling! 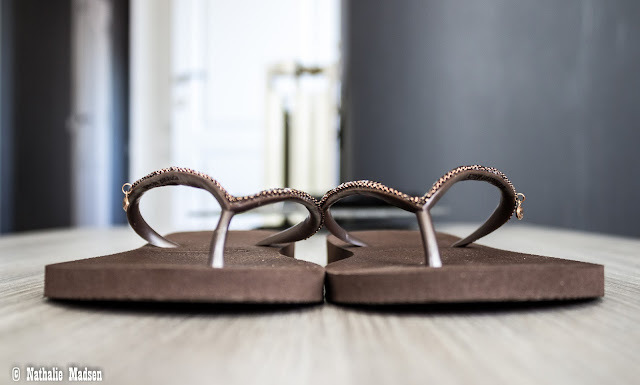 ;) The metallic details on top are giving these Havaianas a more feminine look and allow you to wear them while you take a walk in the city too, instead of wearing them on the beach only. I ordered size 39/40 (European size 40/41), which is bigger than my normal size, but I do have quite wide feet and I don't wanted them to be too small on the sides. Besides that, I don't like to have too little space on front either. Sometimes you see people walking with their toes hanging over the front of their flip flops and it doesn't look comfortable at all. With all that in mind, I ordered the 39/40 and they fit just excellent. I have a European size 39, by the way. I have quite difficult feet, can't wear whatever I want because of heel spur. I wore them for a few hours and didn't had much trouble. I do think I would get sore feet if I wore them for a whole day, but that isn't because of the flip flops, obviously. 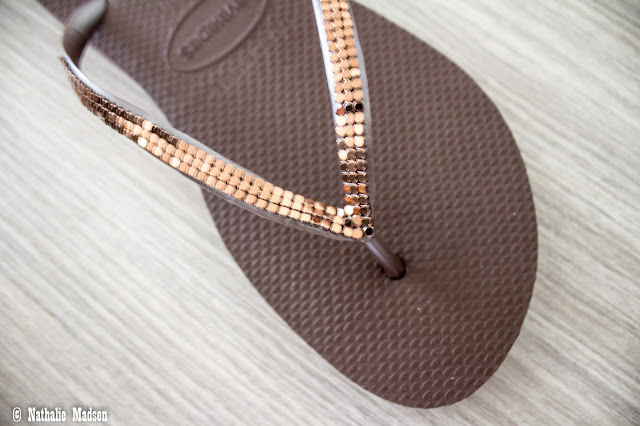 The metal pieces are hand sew onto the upper bands of the flip flop and cause no harm on your feet. 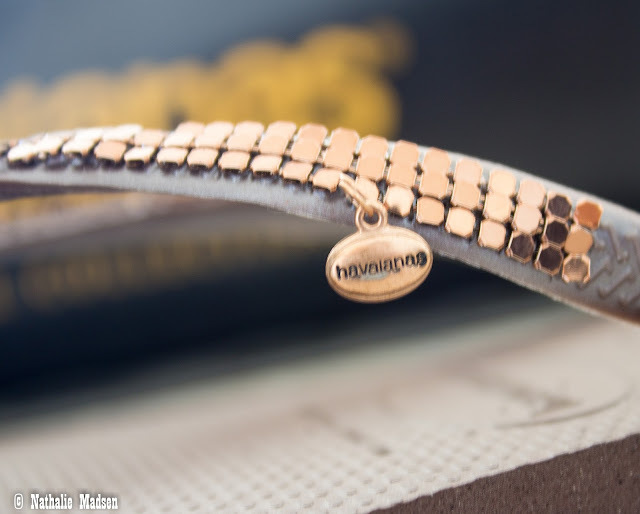 A Havaianas charm is hanging on the side of the band, to make sure you have bought the real deal. The soles also have the brands name engraved in the rubber. The little "thingy" between the toes (I don't know how to call it, sorry! ;) Haha! ), is also made from rubber, which won't hurt your feet. Some brands use plastic to create that little thingy, causing pain when you walk, but the rubber used here, is extremely comfortable. You even hardly notice it. That picture seems to be a little bit blurry, sorry! Normally, within the European Union, the shipping costs are €4,5 for a regular shipping, €8 for an express delivery and you get free shipping when buying two pairs or when you buy over €40. Free shipping doesn't apply on express shipping delivery's though! If you're not living in the European Union, just pick your country and choose your Havaianas, shipping costs are mentioned with every pair of flip flops! You can pay by bank, Paypal and credit card and you have 30 days to return your Havaianas. When ordering your Havaianas, you're even helping the environment, read all about their sustainability here.